iPad caricaturing is great entertainment at all events, including bar mitzvahs, anniversaries, birthdays, baby showers - anywhere indoors or undercover where you want great entertainment and a unique memento for your guests to take home. 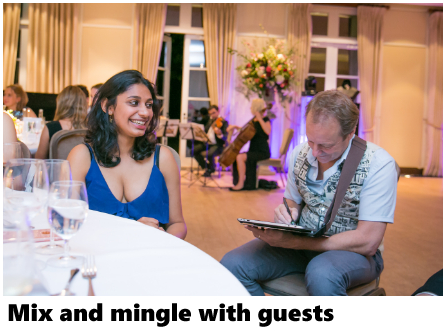 Mix and mingle – This is where the artist mingles among your guests with the iPad drawing your guests’ caricatures. They each get a pocket sized print to take away with them and each print carries your special wording or graphic. This works best where your guests may be moving from room to room, or where space is at a premium. 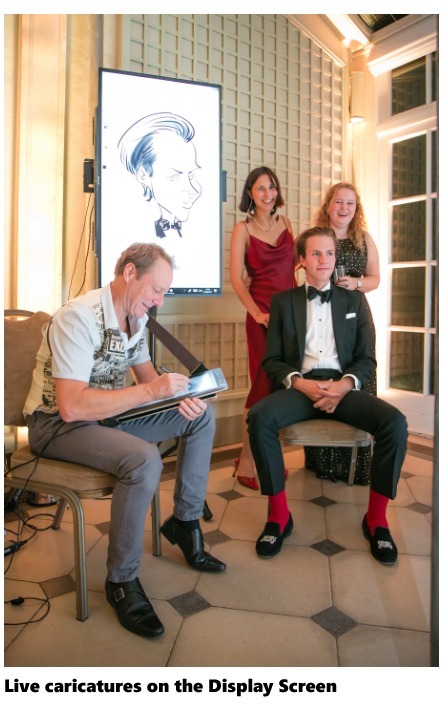 Display screen – The artist is positioned with two chairs alongside the 55” display screen where your guests can sit for five minutes and get their caricature drawn and/or watch the drawings appear live on the screen. Brilliant mesmerising entertainment that everyone can enjoy. They also get a pocket sized caricature print to take away. More – Another advantage to having digital caricatures is that the host gets a copy of all guest caricatures post event. You can also have their pictures uploaded where they can access them post event or we can simply AirDrop them as they’re done to any iPhone. Style - All caricaturists have their own unique style and Rick is noted for his ‘complimentary’ style so there’s no need to worry about anyone getting upset or being insulted it’s all done with good humour and taste.